1. This is huge jump from the one word utterances Nathaniel has tended to use. He shared a lot information here. Sure, the syntax is all jumbled and he’s missing a some key words. But we can’t work on these skills until Nathaniel is giving us more than one word. 2. He is using the core I’ve been modeling. Yes! 3. This wasn’t what I planned for our predictable chart writing this week. I was going to use the sentence “Do you like (spring related things like mud, puddles, rain....) But building on Nathaniel’s interests and making connections between what he talks about and what we write about is really important. 4. When working with one student, predictable chart writing gets tricky. Here’s one way to handle that: Nathaniel picked from his family page who he wants to write with him. We composed a question together with his device asking for the information. “What color ATV do you like?” was our question today. 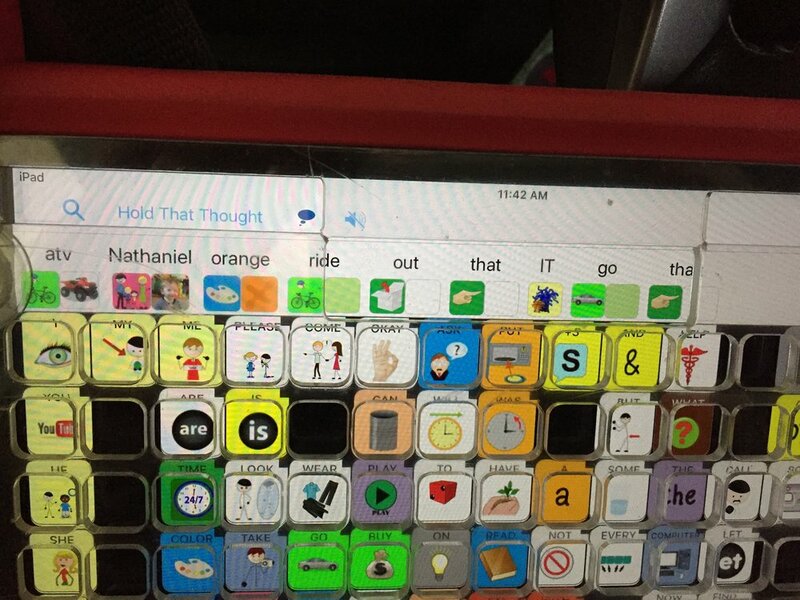 I videoed Nathaniel saying hello and hitting the pre-programmed message window on the device to ask the question. The video is less than 15 seconds. We sent the video to the appropriate family members by text. When they respond, we complete the chart. Communicating about our writing with Nathaniel’s device, videos, and texts adds more layers of language work and breaks down the idea that writing is something we do in isolation. 5. I realized this evening when creating this post that I forgot the plural s on ATV in our chart. This mistake is an opportunity. I will draw Nathaniel’s attention to it tomorrow. I will talk about the sound S represents and plural words. I will revise my writing and add s to each word ATV. Most important is what I won’t say but demonstrate by revising my own work in front of him: it is safe to take risks when writing and communicating; we can always go back and fix it.